Get 20% OFF your online order of oligo pools! ! Our proprietary semiconductor-based electrochemical oligo synthesis platform developed by CustomArray, Inc. allows the precise design and synthesis of thousands of user-defined sequences simultaneously on a coverslip-sized chip, providing you with an affordable, customized oligo pool. Electronic control of the synthesis process produces high fidelity oligos with top-notch sequence accuracy, ensuring all of the sequences you design are represented. Our extensive selection of additional services can also complement your customized oligo pool, offering a one-stop solution for all your screening and engineering needs. With industry-leading turnaround time and affordable pricing starting at less than $0.02/base, GenScript’s oligo pool service is the economical choice for high quality oligos that you can rely on to turn your scientific ideas into reality. Pricing is based on chip size and oligo length. We offer two different chip capacities. Need a larger number of oligos? You can combine oligos from multiple chips into a single pool to meet your specific experimental needs. Our no minimum order size and simple pricing structure makes oligo synthesis affordable, allowing you to quickly and efficiently get what you need! *If you need oligos of 171-200 bases in length, please contact us for pricing and availability. Pricing is determined by the longest oligo length in the pool. We recommend keeping the lengths of the oligos in your pool within 10%. The semi-conductor technology used for oligo pool generation allows for automated control of the synthesis process. Each electrode is individually monitored, generating oligos of the highest quality with top notch sequence accuracy. Post-synthesis visual verification of each synthesized DNA for each electrode by microarray scanner. The customer ordered a 12,000 125 nt oligo pool. By using our proprietary semi-conductor array synthesis platform, we delivered the product within 7 days. 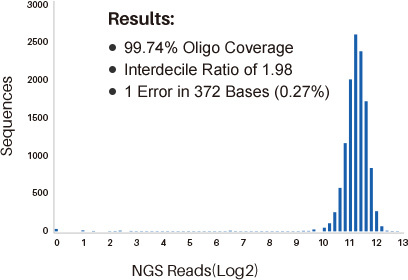 Post synthesis we amplified the oligo pool and performed NGS via illumina Hi-Seq. Results are shown in the figure to the left. Oligo pools have a wide array of uses in various research applications. Click below to learn more about how GenScript’s oligo pool and related services can meet your application needs. gRNA libraries are ideal for high-throughput screening of important molecular targets for developing cancer therapeutics and diagnostics as well as microorganism engineering. These libraries leverage the efficiency and specificity of the CRISPR gene editing technology to either knock-out gene expression or transcriptionally activate genes in the genome. Highly customized gRNA library with oligo pool technology NEW! A pooled lentiviral screen can be performed to identify genes that regulate cellular responses and signaling pathways or to discover novel gene functions. Pooled screening libraries can consist of as few as 50 constructs up to many thousands. GenScript’s siRNA Design Center and chip based synthesis platform make the lentivirus-based RNAi libraries available to verify your research hypothesis. Mutant libraries are used to identify critical residues or regulatory elements and optimize protein structure and function. GenScript offers various mutant libraries customized for your application needs, including industrial & therapeutic enzymes, metabolic & protein engineering and antibody drug development. Our oligo pool synthesis platform allows full control of mutation ratio and creates near 100% coverage of desired variants. Molecular diagnostics based on NGS technology has shown great potential to revolutionize the in vitro diagnostics market. Selectively capturing genomic regions of interest from a DNA sample prior to sequencing reduces the expense of whole genome sequencing and speeds up the discovery process. GenScript’s oligo pool synthesis platform allows high-throughput synthesis of oligos, providing a fast and economic approach to discovery of disease causing mutations or optimization of gene panels in diagnostic kit development. Synthetic biology seeks to make the design, construction, and optimization of biological systems easier, more predictable and reliable. This requires the assembly of DNA circuitry, which can be costly, time-consuming, and complex. GenScript’s oligo pool service allows parallel oligo construction of high sequence fidelity oligos on a large scale, making the creation of synthetic genes and construction of optimized biological systems happen quickly and cost-effectively. New! Easily order your oligo pool online! Click here to place your order.